Once you've found your perfect Quinceanera dress the search is not over, now it's time to pick out shoes, jewelry, a tiara or other hair accessories to complete your look! Here are some trends that we love! If you're going for a traditional look one of your best options is dyeable shoes that can be perfectly matched to your gown. David's Bridal is a popular retailer that offers many styles of dyeable shoes from the highest of heels to the comfiest ballet flats all at very reasonable prices. You can order the shoes online or in stores and return with your gown or a fabric swatch to have them dyed. Also if you're planning on doing a "changing of the shoes" ceremony to symbolize your transition into womanhood you could order a flat pair and keep them white and a heeled pair dyed to match your dress. Your Quince is an opportunity to show your style! 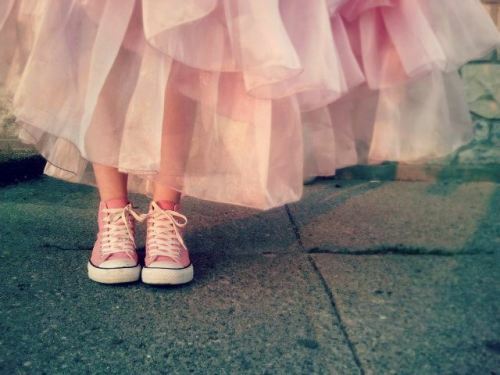 If you're a sneaker girl at heart who says you can't rock your comfy and cute sneakers under the skirt of your gown? You could even take it up a notch and have your honor court in matching sneakers! If boots are more your style we found the perfect mix of country and glamour-Bling Boots! They are a fun and unique change from the typical high heels! When choosing your necklace you want to think about the neckline of your dress, you want to compliment the dress and look balanced. If the upper part of your dress is already intricate choose something simple or nothing at all to draw attention to the dress. If the top of your dress is very plain and simple, choose a more elaborate necklace to spice it up! Earrings are one of the best places to add a touch of bling, especially if you're going with a bare neck! Keep in mind that you may be given earrings to wear during your ceremony as a reminder to "listen to the voice of God" so if that is the case don't wear earrings before the ceremony! For your bracelet, instead of bling that can easily catch on your gown, think about wearing something personal. Check for possible options from your parents, grandparents or padrinos. You may even be gifted a bracelet during the ceremony to wear. If you're doing a "crowning ceremony" your tiara is an important and symbolic part of your Quinceanera, it is a symbol that you are an adult and a princess of God. Choose a tiara that is a reflection of you, whether it's simple and classic or a little over the top!